In my last blog post, I presented an idea to save time by creating beginning of the class routines. I advocated for having a system where the students know what to do even before they enter the gym. My students have been in school for three weeks so far. My returning students know the expectation from last year and therefore had no problem reacquainting to the expectation. However, with students that did not have me last year the adjustment has taken more work. I expect my students to be “on” from the moment they reach the gym and some children aren’t used to that. However, with consistency these students will become acclimated soon. Consistency is always the key. Consistency is always the key. I’m beginning to think I should have named this blog post “Consistency is always the key”. This way of thinking is essential when speaking about one of my other routines I picked up last year at a professional development. Last September, I was fortune to attend a session by Dr. Robert Pangrazi. Dr. Pangrazi is well known in the physical education community. He was a keynote speaker at the 2012 National P.E. Institute and is Professor Emeritus at Arizona State University. The meeting was abuzz because of Dr. Pangrazi’s glowing passion for physical education. 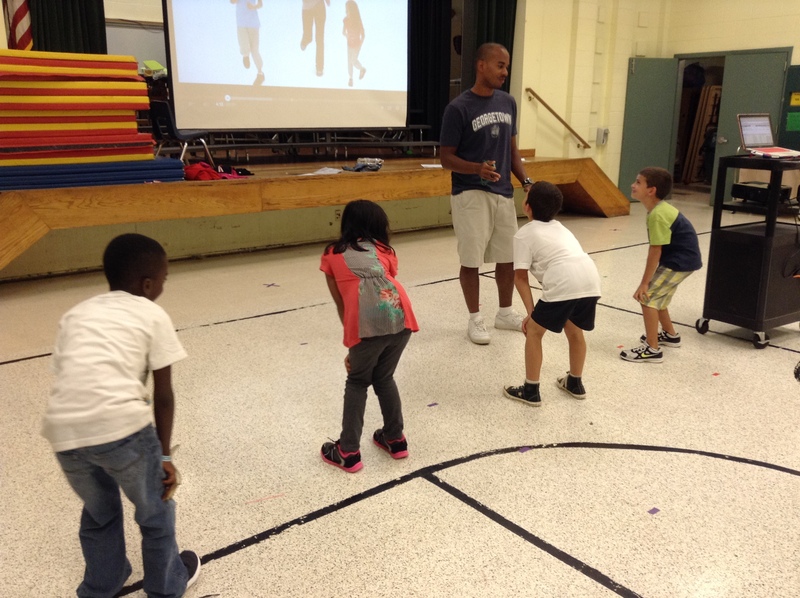 He shared his experience as a PE lifer, urging consistency and holding students to their responsibilities. However one of the simplest demonstrations had the most profound impact on my teaching. Simple I know, but seriously the ready position had such a positive affect on my stop/start transition. It was always important to me that students froze when I blew the whistle or turned the music off. I use these signals to reinforce the goal of an activity, offer a correction, or move into assessment. My classes stop/start a great deal. Just think of how many times you need your classes’ attention. In the class I taught this morning we stopped six times in the lesson. Each time all twenty-six fourth graders immediately assumed the ready position. I have been teaching for eight years now and my first six I thought my stop/start routine was effective. Sure I would have a stray student or two freeze, and then proceed to talk to a classmate or look away while I gave direction. That was normal right? It wasn’t. I was asking the students to freeze and give me their attention, but not requiring it. Having your students freeze and get into the ready position holds them accountable for being focused during the transitional periods of class. 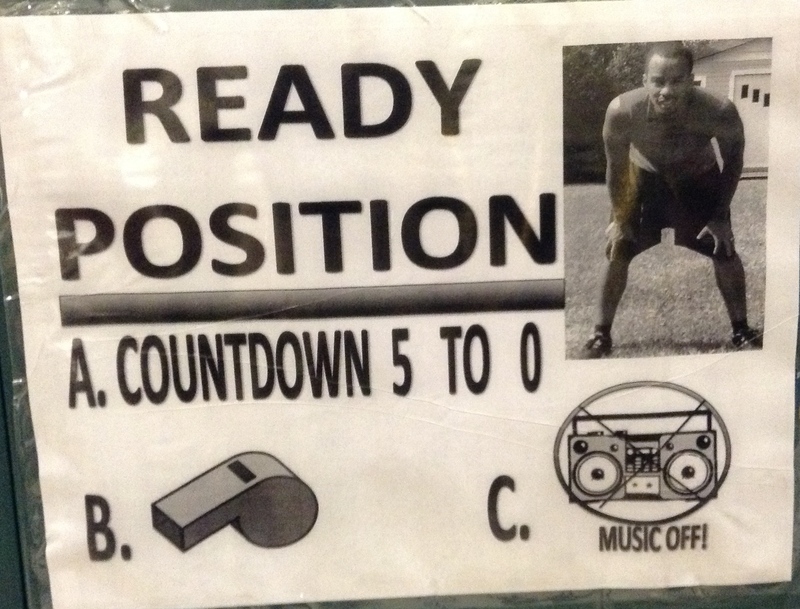 Ready Position: Also know as the athletic position. Hands on knees, eyes on the teacher. It is important to note that 100% compliance is necessary. If a teacher blows the whistle and expects students to get in the ready position, then the teacher should wait until ALL students get in the ready position. This effective routine can be undone if a teacher begins to instruct without all students in the ready position. This sends a message to the students that the ready position is merely an option, and the teacher will go on talking whether everyone is in the position or not. 100% compliance is vital. Use consequences when students aren’t giving the expected results. Remember that transitional periods are where much time is lost away from instruction. This improved my students’ focus and cut down considerably on the time spent during stop/start and any corrections I would make to students not listening while I gave them directions. I use this from Kindergarten up to my 5th graders. I hope passing along this simple routine will help those minutes disappear a little less quickly. Great reminder as I often will move onto the next activity before having 100% of the classes attention. Agree with both points. I retrain a lot in these early months. So worth it when the classes run so smoothly during the rest of the year. More time spent learning, not managing. Worked great with our classes this morning. We have a similar signal that we begin in kindergarten on up, but this seems a wee bit more efficient and our ‘older’ ES students really took to it. Thanks! Any suggestions for 7th & 8th graders? I would have the same suggestion for middle school students. Is there a reason why they wouldn’t respond to getting in the ready position? Maybe a consequence is needed for the students who do not show 100% compliance. I’d echo Jonathan’s thoughts. I’ve taught 6-8 grade for the past 6 years and the ready position is a key part of my classroom management strategy. Has anyone used this at the HS level?